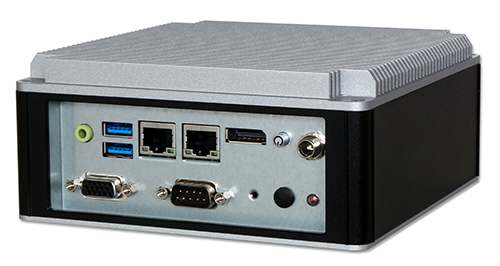 ﻿ PORTWELL RELEASES A RUGGED FAN-LESS EMBEDDED SYSTEM POWERED BY INTEL® ATOM® PROCESSOR E3900 PRODUCT FAMILY (CODENAMED APOLLO LAKE)- Portwell, Inc.
Portwell, Inc., (www.portwell.com.tw) a world-leading innovator in the Industrial PC (IPC) market and an Associate member of the Intel® Internet of Things Solutions Alliance, today announces the release of the WEBS-21D0, a fan-less embedded system featuring Intel® Atom® processor E3900 series (formerly Apollo Lake). Its rugged, compact design, plus low power consumption, make WEBS-21D0 a perfect solution for applications in kiosk, digital signage, in-vehicle mobile video surveillance, medical, and the harsh environments of factory automation. According to Yaling Sun, Portwell´s product manager, the new rugged WEBS-21D0 is equipped with the Portwell NANO-6062, a Nano-ITX form factor embedded board based on the Intel® Atom® processor E3900 series, which integrates the low power Intel® Gen9 graphics engine with up to 18 execution units that improves 3D graphics performance and supports faster 4K encode and decode operations. The compact WEBS-21D0 embedded system also features DDR3L SO-DIMM up to 8GB supporting 1866/1600 MT/s; dual USB 3.0 ports (up to four as optional); one DisplayPort (DP) on rear I/O with resolution up to 4096 x 2160; one legacy VGA interface support; one smart COM port for RS-232/422/485 selected by BIOS; and multiple storage with 2.5" HDD/SSD, mSATA as well as micro SD card. In addition, the compact 150mm x 150mm x 60mm chassis platform integrates the latest M.2 type E interface, which provides wireless connectivity such as Wi-Fi, Bluetooth and NFC (near-field communication) functionalities. "It can serve as an ideal solution as an IoT gateway," explains Sun. "The Portwell WEBS-21D0 delivers greater and faster performance than its predecessors," says Sun, "yet it is still packed within a compact 150mm x 150mm x 60mm system dimension. Moreover," Sun adds, "not only does it operate with thermal design power (TDP) under 12W for fan-less applications, but it also supports a wide voltage of power input from 12V to 24V for rugged applications." Portwell´s WEBS-2000 embedded system series is built from a "brick" concept design created by Portwell´s own engineering team to simplify system customization. It implements an intelligent structure by building the system chassis using three simple elements: wall, pillar and cover. This innovative design of the WEBS system series enables flexible and easy customization. Specifically, this flexible structure makes it easy to adjust chassis size to meet different board form factors for different applications. The Portwell WEBS-21D0 further benefits from the brick concept chassis with top cover/heat sink mechanism that facilitates efficient heat dissipation. The rugged and compact WEBS-21D0 supports a wide industrial temperature range from -20°C to 60°C for harsh environment operations, while at the same time, its fan-less design ensures silent operation, reliability and low maintenance rate and costs. "In addition to wall mounting, WEBS-21D0 supports VESA mounting and DIN-rail mounting," Sun states. "With its fan-less design together with superior, up to quad-core processing power and high capability, the Portwell WEBS-21D0 embedded system is indeed an ideal solution for digital signage, loT gateway and factory automation applications," confirms Sun. The WEBS-21D0 builds on Intel® Apollo Lake SoC and takes advantage of Intel Atom® Dual/Quad-Core™ E3900 Series processor technologies, especially its vastly superior Quad-Core™ processing power and capability. The cost-effective CPU with high performance and low power consumption is of great use to build up a compact system, WEBS-21D0. It supports a wide temperature from -25°C to 60°C for fan-less applications in harsh environment, such as POS, kiosk, digital signage, transportation and automation.